Such a well-known person in the world of blackjack as Edward O. Thorp cannot be described without the enumeration of all Thorpe blackjack achievements: thanks to them, the name of Thorp sounds all the time when the subject concerns blackjack. Edward O. Thorp is a professor of mathematics, one of the 7 initial members of the Blackjack Hall of Fame, the author of blackjack books and articles, the manager of a hedge fund, the author of card counting system at blackjack, due to which he had changed the history of blackjack forever. Let’s try to enumerate all Thorpe's blackjack achievements though it is very difficult to do, as he has a lot of them. 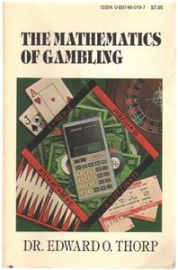 Professor Thorp is the author of many wonderful publications on different topics, such as functional analysis, theory of probability and statistics, mathematics, finances, his general interests and gambling of course. It is quite difficult to count all of them because of their enormous quantity; but they are one more proof of Edward Thorp’s experience and knowledge. Edward O. Thorp has 3 degrees: Ph.D. in mathematics, M.A. in physics and B.A. in physics. He is always invited by different universities and institutes to read the lectures on his specialties (he has a lot of them): financial theory and practice, functional analysis, theory and analysis of games, probability and statistics etc.